You like monsters, right? Of course you do. What about a whole book full of monsters? That sounds cool. What if I told you about the best book of monsters ever? 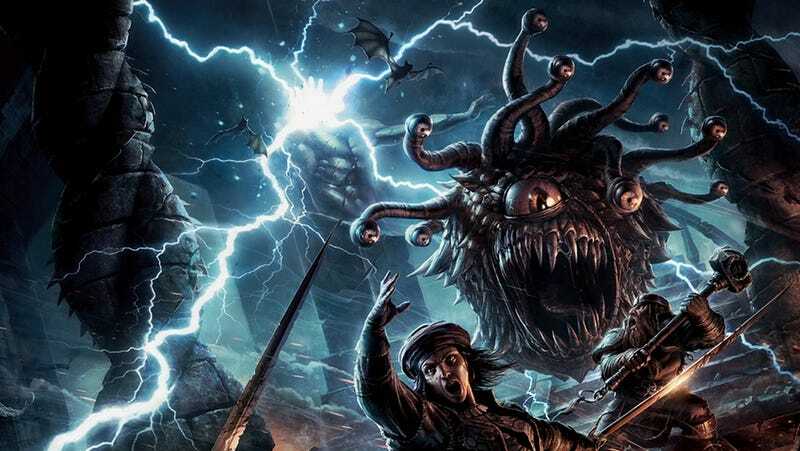 The 5E Monster Manual just might be the one. I have a predisposition to liking books full of monsters. Bring out your creature catalogs, fiend folios, bestiaries, rogue's galleries, and esoteric ecologies — I will devour them all. I don't even particularly care what game system they're from. Some of my favorite books as a kid were just encyclopedias of monsters from horror movies. So I was always going to like this new Monster Manual. I would not have guessed that I'd like it as much as I do, though. This Monster Manual is seriously great. It follows two of the primary mandates that have ruled 5th Edition so far: to unite the best of all previous editions, and to put story and adventure ahead of stats and rules. That first point is very evident, as this feels like a Greatest Hits collection of D&D monsters. Actually, scratch that. There are well over 130 types of monsters in here, plus quite a few variants for each. That makes this more like a D&D monsters boxed set, the one with all the alternate mixes, unreleased tracks and rare b-sides. All the favorites are there: chromatic dragons, owlbears, zombies, hook horrors, cloakers, mimics, even shambling mounds. Some weirder dungeon denizens have made their way into this manual as well, like the flumph, modrons, cambions, and some of the more obscure residents of the Abyss. Monster variants are described in several ways. For instance, mephits and giants come in multiple flavors (ice, steam, dust, hill, stone, storm, etc.). Some monsters, like orcs, get extra stats for a variety of challenge ratings — there are some tougher orcs than your basic cannon fodder garden variety. The most interesting variants are those that apply spell abilities or roles that fill a different niche within that monster's ecology or society. The mind flayer, for example, has the usual stat block, but also a small sidebar describing mind flayers that use magic instead of just psionics. These mind flayer arcanists get some statistical additions (mostly a list of spells they know), but also a bit of color ("they are regarded as deviants by their illithid peers and usually shunned."). Monster game mechanics start with the usual stuff, armor class, hit points, resistances, and ability scores. Each monster also gets a fun list of specific attributes and abilities. Some of these are fairly mundane, like a lizardfolk's ability to hold its breath, or the fact that the kraken is amphibious. Some of them are colorful and particular to that monster. The kraken, for instance, is a siege monster, so it does double damage to objects and structures. A myconid has a unique "distress spores" ability that causes other myconids nearby to feel its pain. Whether they have a direct statistical effect on combat or just create flavor, these abilities do so much to flesh out the monsters and make each one feel interesting and fun to encounter. Truly special monsters get some extra care. Dragons, liches, sphinxes, vampires and the like have legendary actions they can take out of turn, and they have additional lair actions they can take if you challenge them on their home turf. This is an awesome way to make a boss monster feel badass and unstoppable without just loading up with a trillion hit points and an unhittable AC. This adds some complexity to combat, but not too much — a vampire's legendary action, for example, can be a simple move action, showing its terrifying speed. Dragons' lair effects often resemble casting a spell related to that dragon type, like a bronze dragon's fog. These abilities all borrow from 4E's solo monster concept, although it's been refined quite a bit. Challenge rating has been an area of some controversy with this Monster Manual. 5E has worked very hard to eliminate one of the biggest problems with earlier editions, the challenge rating treadmill. That is to say, in older editions as you increase in level your attacks have higher bonuses and do more damage, but as monsters increase in challenge rating they have higher armor classes and more hit points. Nothing changes from low level combat to high level combat other than bigger numbers (and worse, it unbalances the game since non-combat focused characters end up with slim chances of hitting, doing paltry damage even if they do at high level). How do you make some monsters tougher than other monsters if you're trying to flatten out the differences between levels? To be sure, they do get tougher. Higher CR monsters have more hit points and higher ACs then low CR monsters, but the differences aren't as pronounced. A hill giant is a CR 5, and it has an AC of 13 with 105 hit points. A marilith, a CR 16 demon, has an AC of 18 and 189 hit points. There's a difference, but it's not as huge as you might expect. (By way of comparison, in Pathfinder, a CR 5 bearded devil has AC 19 and 57 HP; a CR 16 ancient black dragon has an AC of 38 with 297 HP). There's also a lot of variation based on the monsters themselves. There are some lower CR monsters with tons of HP because they're big hulking brutes (like the hill giant in the example above), while some higher CR monsters are glass cannons with deadly spells at their command but an unimpressive hit point total. The bulk of the monsters in this book cluster around a challenge rating of five or below, so you'll likely end up making groups of them to challenge higher level characters (or just make them more clever). The takeaway here is that challenge rating isn't that important. Unlike other editions of D&D, every encounter doesn't need to be perfectly balanced for the players' level. Yes, an ancient red dragon is probably going to obliterate your 3rd level party, but did you really need a CR number to clue you in? This also makes the complaints about the book's lack of a CR index a bit silly (Wizards put one up on their website anyway). I love mixing up encounters, both as a player and as a DM. The tension of not knowing what awaits in the next room of the haunted castle, that it might be something way too powerful for you to defeat with the usual barrage of attacks, amplifies the fun of D&D immensely. This is as much a matter of gaming philosophy as game mechanics, but the de-emphasis of challenge rating certainly nudges things in that direction. Ultimately, the Dungeon Master's Guide will have more info on building adventures and encounters for players who want things more balanced. Where the Monster Manual really shines is in the parts with no stats whatsoever. Every monsters has text devoted to describing its ecology, motivations, and other cool things about it in a pure story sense — at least as much space is devoted to this as to stat blocks. But what I really love is that each entry isn't just a free form essay about displacer beasts or drow society. Everything is broken into bolded headers, like bullet points about that monster. And each header gets a short paragraph of description. That means you can understand the basics of a monster at a glance. A hell hound has a Burning Hunger and is Evil to the Core. Unicorns are Divine Guardians, Forest Lords, and they have Sacred Horns (by the way, 5E unicorns are awesome, so awesome you will want to make adventures involving them). You can dig a little deeper and get all kinds of great story hooks and adventure ideas by reading those short paragraphs. On top of that, you'll find sidebars calling out specific stories about famous monsters from D&D's long history. The demilich entry talks about Acererak, while the vampire entry has a section devoted to Strahd. Legendary creatures get tied directly into world-building too, since each one has regional effects. An aboleth befouls all water within a mile of where it lives. Within a mile of a beholder's den, people randomly feel as if they're being watched, and reality sometimes warps in strange, minor ways. White dragons cause wintry weather within six miles of their lairs. In fact, here's an excellent article by Lyndsay Peters that explains how to create your campaign map using monster regions. It's unnecessary for me to say much about the art (I love it, with a few specific exceptions), because Wizards of the Coast provided enough of it for this review that you can see for yourself if you like it or not. It is all new art, though many images are clearly homages to classic art from previous editions.There's a mix of styles, but each style seems suited to the monster being depicted. I knew I was going to like this book as soon as I saw the screaming beholder on the cover. This Monster Manual is definitely my favorite 5E book so far. Check out these preview pages to get an up close look at some of our favorite monsters.